One evening in Beijing, my tour group had supper at a family home located in a hutong. A hutong is an old residential neighborhood. Many were bulldozed in the name of progress and replaced with skyscrapers, but apparently, the Chinese government put a stop to it in order to preserve those that remain. This was an opportunity to see a private home, and get away from the bland meals served by the restaurants that catered to tour groups, even if it was only for one evening. One of the highlights of my trip to China in October was Shanghai. With a population of over 24 million, it is three times bigger than New York. If you combine Shanghai’s population with the 8 million who inhabit the city of Suzhou which is just two hours away, it almost equals Canada’s population which is just over 36 million. Shanghai rivals New York City in razzle dazzle. Every evening from 6p.m. to 10p.m., it puts on a light show along The Bund that highlights the old and the new sides of the city. Here’s a short 2 minute video that I put together. It doesn’t do it justice, but I hope you enjoy it. I went on a group tour of seven cities in China in October which is considered an ideal time to go. There were so many things to consider in preparation for the trip, the main one being what to wear as the tour started in the north in Beijing where the temperature was supposed to be about 12C to Guilin in the south where it should have been around 20C. During the trip, we learned that the weather forecast was, as our tour guide put it, “just a suggestion”. I packed long sleeve t-shirts and a jacket for Beijing’s cold weather forecast and ended up wearing short sleeve t-shirts as the days were hot and sunny. Elsewhere, cloudy forecasts turned out to be either drizzle or heavy rain. Rainy forecasts in the south were hot, humid days instead. I regretted not bringing a pair of shorts, but when we returned to Beijing for the flight home, the temperature had dropped to 7C. When a friend e-mailed me that May Wong was coming to Montreal to do a reading this past Sunday, I knew I had to go. Her book, “A Cowherd in Paradise: From China to Canada” is about her parents who were separated for years because of Canada’s Exclusion Act which came into law in 1923. My parents story sounded similar to hers and so I went eager to hear what she had to say. 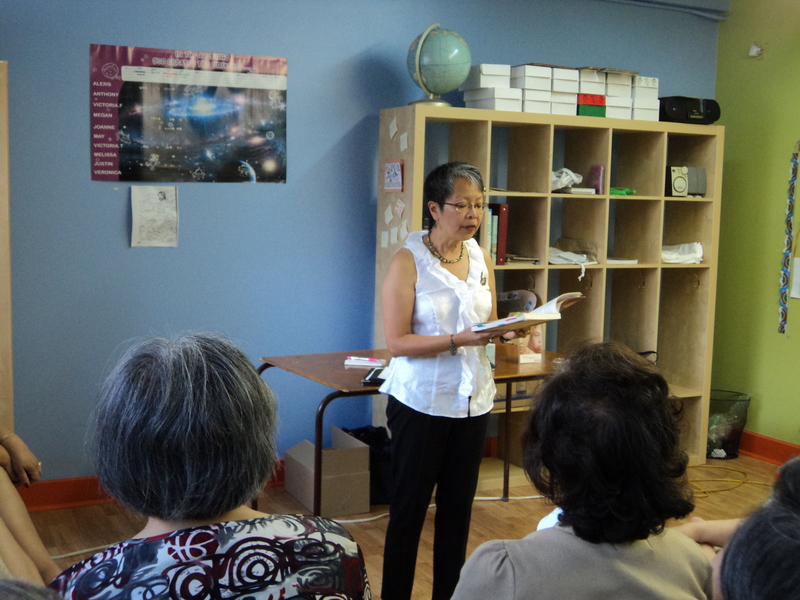 Wong had the audience’s rapt attention as she set the background for her story, explaining the historical details that shaped her parents’ lives. Her father chose her mother from a picture. Her mother didn’t know what her future husband looked like until after the wedding ceremony. While her father was establishing himself as a restaurateur in Montreal, her mother was in China stuggling to survive natural disasaters and the Japanese invasion. The title of the book is a tribute to her mother who was responsible for the family’s water buffalo when she was a little girl. The book includes old family photos and a copy of her father’s head tax certificate. While I haven’t read the book yet, I think it would be interesting for those whose parents, like mine, didn’t talk about the past. It is very fortunate that Wong’s mother, not only wanted to tell her stories, but also wanted Wong to publish them. The book is a treasure not only for Wong’s family, but for families of other head-tax payers as well. Years ago, when I decided to see if I had the stuff to be a writer, I took a creative writing course at a Continuing Education program at Concordia University. The teacher, to inspire us, told us to write what we know. It sounded simple, and I’ve heard that piece of advice many times since, but I had difficulty because I didn’t think people would be interested in what I knew. I ended up writing a short story based on my experience of working in my family’s restaurant which was eventually published as a children’s picture book, The Fragrant Garden. Since then, I’ve written several stories, both fiction and non-fiction about the Montreal Chinese Community. It’s a way for me to learn about its history as well as my family’s history. My father was a head tax payer. He was 13 years old when he landed in Vancouver on November 28, 1921 and paid $500 to enter Canada. He never said much about his past, so when I do research, I can only imagine what his story is about. Now there is an educational website, The Long Voyage: From Pigtails and Coolies to the New Canadian Mosaic, about that period in Canadian history and the history of the Montreal Chinese Community. It has video interviews with descendants of head tax payers and an overview of the history of the Chinese in Canada. Anyone who is interested in Canadian history or the history of head tax payers will find this site useful and informative. It might also spark some interesting conversations in some families.